Despite the lack of a rewards program, the Capital One Secured Mastercard’s low security deposit, reasonable fees and shorter pathway to a higher credit line makes it a good option for credit-building consumers. Access to higher credit line? When you’re trying to build your credit – or even rebuild it after a money misstep or two – the best credit cards and financial products are typically out of reach. But while the Capital One Secured Mastercard is pretty low frills, it does offer an inexpensive way to raise your credit score and demonstrate responsible credit usage over time, which should open the door to unsecured cards with better terms and benefits. The security deposit required for the Capital One Secured Mastercard ranges from $49 to $200, depending on creditworthiness. This is a much lower barrier to entry compared to some other secured credit cards, many of which ask applicants for at least $300 (or even more) in upfront collateral. The security deposit can be paid over time and is fully refundable if you close your account (provided your balance is paid in full) or if you graduate to an unsecured card with Capital One. So long as you make the minimum required security deposit, which could be as low as $49, you’re guaranteed an initial credit line of $200. You can choose a higher credit line by depositing more money prior to your account opening, but your credit line will only increase by the value of said deposit, up to a maximum line of $1,000. Cardholders can also gain access to higher credit lines by making their first five monthly payments on time. This is an important step toward exhibiting the kind of responsible credit usage that could help you graduate to an unsecured card – perhaps one with a rewards or cash back program. Speaking of a rewards program, the Capital One Secured Mastercard has none to speak of. This is par for the course when it comes to most secured cards, though there are other options in this category that do offer valuable rewards, such as the Discover it Secured card’s 2 percent cash back at restaurants and gas stations and 1 percent cash back on other purchases. With no annual fee, it costs virtually nothing to open a Capital One Secured Mastercard account – other than the initial security deposit, of course. And, provided you pay your balance in full and on time every month, you won’t be subject to additional interest, fees or penalties (more on that later). Like most secured credit cards, the Capital One Secured Mastercard comes with a hefty APR, although 26.99 percent is admittedly on the higher end for this category. 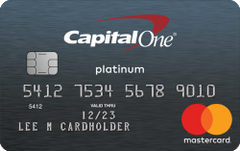 Most notably, the Capital One Secured Mastercard comes with neither balance transfer fees nor foreign transaction fees. In addition, Capital One won’t hike up your APR if you pay your bill late, nor will it charge you a fee for returned payments. Its other fees and penalties, however, are fairly standard when it comes to secured cards. Besides the aforementioned APR – which could quickly drive up your overall balance if you fail to pay off your card in full every month – making a late payment will cost you up to $38, whereas taking a cash advance will subject you to a fee of $10 or 3 percent, whichever is greater. Save yourself the extra cash by keeping current on all payments and avoiding cash advances. CreditWise – CreditWise helps you stay on top of your credit score and keeps an eye out for potential fraud tied to your Social Security number. You’ll also receive alerts anytime there are changes to your TransUnion credit report. No foreign transaction fees – Use the card to make overseas purchases without incurring a 3 percent foreign transaction fee. 24-hour travel assistance – If your card is lost or stolen while traveling, you’ll receive an emergency replacement and a cash advance. Extended warranty – Enjoy additional warranty protection for free on eligible items purchased with the card. Price protection – This benefit reimburses you the price difference on eligible items when you find a lower price within 60 days from the date of purchase. $0 liability – You’re never liable for charges made if your card is lost or stolen. Although no secured credit card offers guaranteed approval, you’ve got a pretty good chance of qualifying for the Capital One Secured Mastercard thanks to its required security deposit, which reduces the risk of you defaulting on payments in case you charge more than you can afford to repay. Even if you’ve defaulted on another loan or credit card in the past – or have been turned down for credit recently – you’re still eligible to apply and will likely be approved. That said, you do need to be at least 18 with a valid checking or savings account. Plus, your monthly income must exceed your monthly rent or mortgage payment by at least $425, otherwise Capital One considers you unable to make your regular credit card payments. A non-discharged bankruptcy could also cause you to be declined. You’re looking for a card to help build or rebuild your credit. You can afford at least a $49 security deposit. You’re looking for a card with a low barrier to entry. You’re less concerned about earning rewards than you are about increasing your credit score. You want a card with access to a higher credit line if you make timely payments. Make all payments on time to avoid incurring penalty fees (not to mention a hit to your credit report). Consider signing up for autopay so you don’t forget. Making timely payments is one of the best ways to establish a healthy credit history. Consider increasing your initial credit line by making a higher-than-required security deposit. Doing so can help improve your credit utilization ratio, another major factor in your overall credit score. Avoid taking cash advances, the fees for which can quickly increase your total amount owed. Pay your regular balance in full every month to avoid accruing higher-than-average interest charges. Not to mention, carrying a balance can make it more difficult to demonstrate your reliability to card issuers.